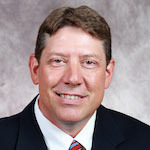 Kirk Hartman came to the HuskerVision staff in 1994 and was promoted to the position of executive director of video production in September of 2009. He had previously been named HuskerVision's creative director in 2004. Hartman oversees the creative process for the nationally acclaimed production unit that produces video programming for the big screens in Memorial Stadium, the Bob Devaney Sports Center, Pinnacle Bank Arena, and Hawks Field. In addition, Hartman is the executive producer for the Nebraska Football Show, directs football stadium big screen productions, produces men's basketball big screen events, and oversees the production of all HuskerVision coaches’ television shows. He is responsible for an award-winning production team that includes full-time staff and students, and oversees the production of highlight videos for all sports. Prior to joining the HuskerVision staff, Hartman served as senior director of KOLN/KGIN-TV nightly news programs for nine years. Before moving to Lincoln, Hartman was a radio personality for KOLT in Scottsbluff. He has also worked for HKM Productions in Los Angeles and John Crow Productions in Dallas, working on video broadcasts of professional sporting events. Hartman earned a bachelor’s degree in broadcasting from Nebraska-Kearney. A native of Paxton, NE, Hartman and his wife, Linda have a daughter, Megan, and a son, Cole.